The F-35 Joint Strike Fighter flight test program recorded three significant test milestones on May 27. An F-35B of the Edwards AFB Integrated Test Force (ITF) conducted a sequential engagement of two manoeuvring air-to-air targets using AIM-120 AMRAAMS missiles over the Point Mugu Sea Test Range airspace in California, the first dual AMRAAM shot from any F-35 variant, and the first live AMRAAM shot from the F-35B variant. Also from the Edwards ITF, an F-35A conducted a 1.9 hour mission with the first load of Block 3i hardware and software. Block 3i is the next level of capability and is planned to support USAF F-35A IOC in 2016. 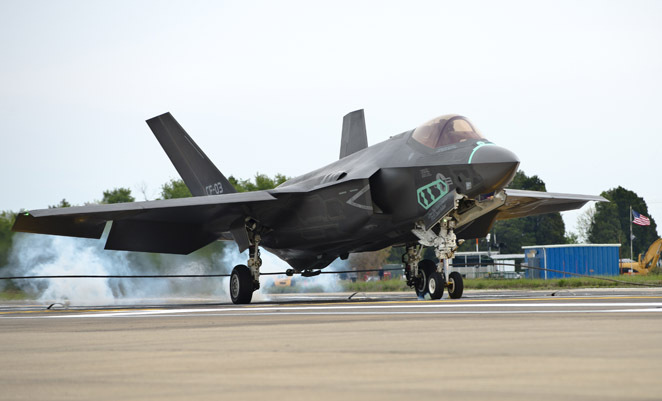 And on the east coast, F-35C CF-3 completed an arrested landing at its maximum sink speed to test the aircraft’s landing gear, airframe and arrestment system at NAS Patuxent River in Maryland. The aircraft flew five sorties, building up the maximum sink rate test condition of 21.4 feet (6.8m) per second, and conducted three arrested landings, several touch and goes and one ‘bolter’. The F-35C’s hook has undergone a re-design after it failed to trap arrestor wires during previous trials.